Just a year after its founding, it’s the country’s leading party. Pablo Iglesias, a leader of the Spanish anti-austerity political party Podemos. If the current poll numbers hold, Spain’s next prime minister will be Pablo Iglesias, a pony-tailed 36-year-old political scientist who cut his teeth in the Communist Youth and the anti-globalization movement—but whose party, Podemos, wants “to change the rules of the political game,” Iglesias told the journalist Jacobo Rivero. Left and right, he added, are metaphors that are no longer “useful in political terms”: “the fundamental divide now [is] between oligarchy and democracy, between a social majority and a privileged minority.” Or, as Podemos likes to put it, between la gente and la casta, the people and the caste. Podemos was founded only a year ago and, in May, it stunned Spain’s political establishment by winning five seats in the European Parliament (1.25 million votes, nearly 8 percent). In many respects, the party—whose name translates as “We can”—is the Spanish sibling of Greece’s Syriza. Central to its still-evolving platform is a broad set of economic-stimulus measures that buck the European obsession with austerity as the only way out of the continent’s economic crisis. Among other things, Podemos proposes a restructuring of the national debt, a “deprivatization” of essential services such as healthcare and energy, and a form of universal basic income that would provide a road back into Spain’s anemic economy for the millions of unemployed—officially nearly 24 percent of the workforce, and as high as 54 percent among those 18 to 25. The party also wants to reform the country’s Constitution, which cemented Spain’s democratic transition in the late 1970s as a compromise between the Franco regime and the opposition. For Podemos, the Constitution has become a “padlock”: the cornerstone of the failed “regime of ’78” that, starting in the 1980s, was built on a bipartisan consensus between the center-left Socialist Party (PSOE) and the right-wing Popular Party (PP), breeding corruption while stifling democracy. The ascension of Podemos has changed the face of European politics, raising the prospect of a powerful southern coalition riding an electoral wave to challenge the austerity policies imposed by Germany and the European Central Bank. (Podemos, Syriza and other parties have joined the European United Left coalition in the Parliament in Brussels.) In Spain, as in Greece, Italy and Portugal, these policies have been nothing short of disastrous. In addition to the massive unemployment, Spain’s national debt has soared close to 100 percent of gross domestic product and, according to the grassroots organization Platform for People Affected by Mortgages (PAH), nearly 570,000 families have lost their homes since the housing crisis hit in 2007. Under Spain’s antiquated mortgage law, homeowners retain their debt even after foreclosure; thus, over 1 million people have been sucked into a black hole of financial despair. The country has seen a wave of economically induced suicides. According to UNICEF, Spain’s child-poverty rate is at 36.3 percent. And the country suffers Europe’s largest rate of income inequality, with the top fifth enjoying seven and a half times the wealth of the bottom fifth. While leftist parties in Spain and elsewhere tend to view the mass media with contempt and the people appearing on TV as tainted, Podemos has opted for the opposite approach. Iglesias and other party representatives like Bescansa, Íñigo Errejón and Juan Carlos Monedero have taken to Spanish television, incessantly participating on the tertulias—political-debate shows—and appearing in interviews on the country’s commercial channels. They’ve more than held their own against politicians like Esperanza Aguirre, the head of the Partido Popular in Madrid, and journalists like Eduardo Inda (the Spanish equivalents of Mitch McConnell and David Brooks, respectively). On TV, Podemos members have set themselves apart with a clear, commonsensical message, a distinct lack of fear and even a different style of dress: Iglesias sometimes wears a tie but never a jacket, while Monedero prefers political T-shirts and a red neck scarf. And unlike their opponents, they are always well prepared. “People think that politics happens in parties or collectives, but that’s not true,” Luis Giménez says in the first pages of Claro que Podemos, his recently published book on the party, co-written by Ana Domínguez. “Politics happens in the media.” That strategy has borne fruit. At first, Spain’s commercial media provided ample space to Podemos because it boosted ratings. Later, they unleashed their fearmongering campaigns—promulgating baseless accusations about Iglesias’s and Monedero’s financial connections to the Venezuelan government and Errejón’s research grant at the University of Málaga. John Müller, an economic reporter for the conservative paper El Mundo, even edited a frenzied book critical of Podemos that was published only a month after the May elections. But the larger the media’s magnifying glass on Podemos, the more the Spanish public appears to support it in the polls. “We don’t want to be a party. we don’t want to be a coalition of parties. We don’t want to be a new commodity in the electoral marketplace,” Iglesias proclaimed to a crowd of more than 100 at the doorstep of the Teatro del Barrio in Madrid on the brisk winter morning of January 17, 2014. “What we propose to you all is a method.” Iglesias was speaking to the people who couldn’t fit into the Teatro’s 130-person-capacity playhouse, where he’d given a press conference introducing a political initiative called “Podemos” moments earlier. The event had come on the heels of the publication of Making a Move: Turning Indignation Into Political Change, a manifesto signed by twenty-eight intellectuals and activists, calling for a political campaign to “regain popular sovereignty.” Iglesias went on to ask the members of his audience to sign a petition if they wanted the initiative to continue and to develop into a party in time for the European Parliament elections several months later. He set the bar at 50,000 signatures. Podemos supporters met that mark in a little over a day. That sentiment is widely shared outside of Podemos. Journalist Jacobo Rivero, the author of a book-length interview with Iglesias, notes that the 15-M movement profoundly changed Spanish society. “Regular citizens have discovered that they can do political work, that anyone can participate in politics,” he says. The historian Sánchez León echoes Rivero’s sentiment: “Something very interesting has happened in Spain: the people have finally discovered that they are smarter than their own politicians.” This change in consciousness has been the direct result of practices that grew out of 15-M, in particular the proliferation of assemblies that organized everything from local libraries and school-lunch programs to political seminars and the collective editing of manifestos that were read aloud or even delivered to the Spanish Parliament. Such grassroots assemblies, organized around particular issues, interests or communities, are now the lifeblood of Podemos. Called “circles,” these citizen groups debate and come up with proposals behind which the party and its leaders must throw their weight. Citizens can participate in more than one circle at a time; as Bermejo explains, multiple memberships are encouraged. A medical doctor residing in Lavapiés, the bohemian Madrid neighborhood where Podemos was born, would be privy to local issues affecting the community, and thus could serve as an informed participant in the Lavapiés Circle. But she may also provide a much-needed perspective on public health and thus could play an important role as a member of the Public Health Circle. Social media and innovative web platforms like Reddit, Appgree and Loomio make this kind of fluid citizen participation possible on a broad scale and in real time. Podemos has even sought out and developed its own platform, based on open-access code and software, that will soon be copied by a number of parties from other countries. Several months ago, an article appeared in The New Yorker describing Podemos as the “world’s first Reddit party.” While it’s true that members have developed an innovative use of the platform—proposing, debating and amending political positions on the subreddit Plaza Podemos—Miguel Ardanuy and others in charge of the party’s web presence reject the label. 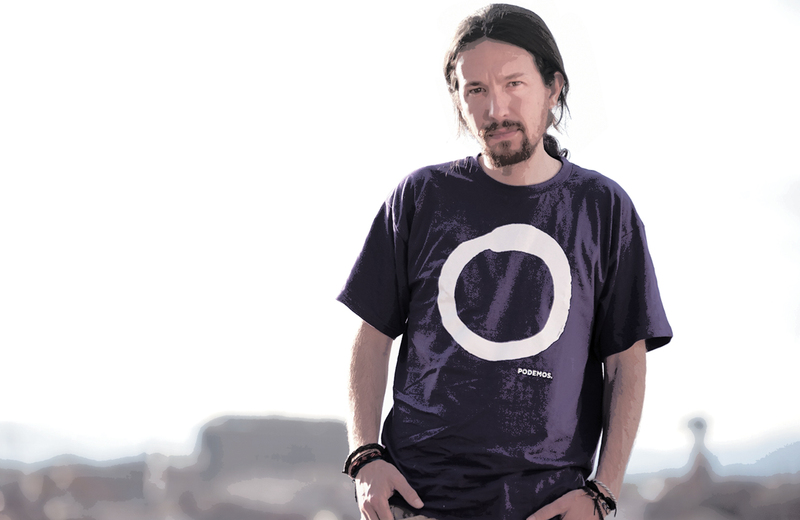 Podemos is “neither a television-, social-media-, community- nor a street-only party,” he says. Its power instead resides in “the ability to bring together these experiences and make them reinforce each other.” Others have pointed out that Reddit offers a window only into the back-and-forth, not the consensus-building that is the cornerstone of the “circle” model. In September, Podemos launched a two-month Constituent Congress that included thousands of circle meetings, broad online debates, electronic elections and a mass meeting in the Palacio Vistalegre in Madrid. In an unprecedented exercise of direct democracy, more than 100,000 people participated in the process, which yielded an organizational structure and a set of basic ethical principles for the party. At the closing event on November 15, at the Teatro Apolo Nuevo in Madrid, Podemos presented its secretary general, Pablo Iglesias, along with a Committee of Guarantees to guard procedures and protocol and a sixty-two-person Citizens Council. The event evoked a spirit of enthusiasm, a sense of purpose, and even a sign of Southern European solidarity against Brussels and Berlin. Among the hundreds of journalists and sympathizers who filled the old theater to the brim were all the main representatives of Europe’s new social movements. The crowd was addressed by Syriza leader Alexis Tsipras, Jean-Luc Mélenchon from France’s Left Front and Marisa Matias, a Portuguese member of the European United Left. “The marionettes in Brussels and in our own countries’ governments…decided to punish our peoples. In their view, we are lazy and live above our means and have no right to healthcare, education or even a home,” Matias said. “We have a message for the marionettes and the faceless powers: if you threaten our lives, we will take the power.” Tsipras argued that the European tables have already been turned: “Today, it’s [Angela] Merkel who is asked what she will do when Spain and Greece have governments that are of the people and just,” he said. Yet for some Podemos supporters, the final act was a disappointment. They felt the two-month Constituent Congress had not been true to the party’s core democratic principles. In September, members were asked to collaborate in writing three documents—ethical, political and organizational—that would form the basis for the party and be debated at the congress. The open call was originally answered by more than 250 documents in September. By October, the merging of documents pared that number down to around fifty. At Vistalegre in mid-October, each group was given a time slot to make the case for its document to become one of the foundational pillars of Podemos. The meeting inevitably accentuated important differences within the party, but two tendencies stood out. Leading a professor-heavy team that included Bescansa, Errejón, Monedero and Luis Alegre (all of whom are affiliated with the Complutense University of Madrid), Iglesias put forth his own proposal. Pablo Echenique, a physicist and Podemos member in the European Parliament, presented the strongest alternative, an organizational document that many thought was more inclusive than Iglesias’s. Echenique’s proposal would have given more power to the party’s circles over questions of repeal and control, instead of dividing the responsibility among three bodies: the party members, the Citizens Council and the organizational leadership. Echenique’s proposal also called for three secretaries general, not one, and introduced the idea that 20 percent of the Citizens Council be elected by a drawing, rather than 100 percent by a direct membership vote. These measures were intended to avoid the traps—and power trips—of traditional politics. Miguel Urbán, an activist from the Anticapitalist Left who has known Iglesias for years and was an original signer of the January manifesto, insists that Iglesias’s seeming pragmatism is in fact an abandonment of principle. “Iglesias says that if you want to win in politics, you have to leave your principles at the door,” Urbán asserts. “I say that without principles, winning doesn’t make any sense. I want change, not a replacement. We have to maintain the goal of self-government.” Other supporters of Echenique point to the not-so-democratic idea of requiring members to vote on the three documents as a bloc instead of separately. Echenique, in fact, only presented an organizational document. Had Podemos members been given a chance, some think, they might have chosen his organizational document along with Iglesias’s ethical and political ones. This kind of plural basis for the party’s foundational documents might have more accurately represented its more than 314,000 members. Meanwhile, the online elections for Citizens Councils at the municipal level, which were held in December, further strengthened the position of the Iglesias faction. The writer Rafael Narbona succinctly summarizes the arc of the past year from a distance: Podemos has “taken advantage of the legacy of the 15-M, made use of the assembly model, but in the end constituted itself as a traditional party.” As a result, the entire leadership structure is filled with people close to Iglesias. “That was a mistake,” says historian Sánchez León, “although an understandable one. There is a difficult road ahead, and Pablo wants to have a team he can work with. Carolina Bescansa is the best political analyst in Spain today. Errejón is only 32, but he is absolutely brilliant.” The team also has plenty of international experience: Errejón has worked closely with Bolivian President Evo Morales, while Monedero—at 52, the oldest of the core group—was an adviser to Venezuela’s Hugo Chávez. Debates still rage over Podemos’s future. The approach of municipal elections on May 24 has led many party members and political observers to speculate as to the role its swelling influence may play. In October, after a heated debate, members voted not to join those elections under the Podemos banner. Iglesias’s group argued that participating in the local elections—more than 8,000 races—was simply too big a risk. As a young organization, they felt, Podemos would be vulnerable to infiltration by candidates who didn’t meet its strict ethical standards. Instead, local groups are encouraged to support coalitions of “popular unity” that share Podemos’s basic principles. Beyond the left, many think that the future of the Socialist Party rests in the hands of Podemos. The journalist Emilio Silva speculates that the death knell may soon sound for a party that was founded over a century ago by another Pablo Iglesias. “I can see a scenario unfolding in which Podemos wins the 2016 general elections, but not with an absolute majority, after which the PP and PSOE form a coalition to block Podemos from governing,” he says, adding: “That will be the end of the PSOE.” It would be poetic justice in the eyes of those leftist critics who, ever since Spain’s transition to democracy in the late 1970s, have watched the party abandon its Marxist and working-class origins and move steadily to the right. The main headquarters of Podemos today is in an office building at the gateway to the Gran Vía, Madrid’s equivalent of Times Square. The entrance to the building looks rather chic, but once you make your way to the party’s seventh-floor office, you can’t help but notice the missing wall panels, discount furniture and naked wiring. Empty desks and porch chairs are often the only items in a room. (“We’ve only been here for about a month,” a member of the Podemos media team says.) From there, it’s approximately a thirty-minute walk to the other Podemos headquarters, in Lavapiés, one of Madrid’s most ethnically diverse neighborhoods. Ninety feet up the street from Teatro del Barrio, the office is housed in a small storefront with one of those typical graffiti-covered metal gates. When you lift the gate, you see Podemos pictures, announcements and decals plastered across the windows. Inside, there’s a cozy storage and meeting space that archives a year’s worth of documents, banners and memories. Today, Podemos is caught between two rival aspirations: on the one hand, to stay true to the egalitarian principles from which it arose; on the other, to win elections, which means making its message appeal to all Spaniards—young and old, progressive and conservative. After revealing how the party came to have an office at a fashionable address overlooking the Gran Vía, the media-team member quickly adds: “We’re looking for another, larger space to combine both offices.” One might hope that with this future consolidation, Podemos leaves neither a view of Lavapiés nor the Gran Vía behind.